View More In Manipulation Therapies - Page 4. The Shiatsu Massage Mat is a futon-style mat suitable for Thai Massage, Shiatsu Massage, and other types of bodywork. The thick cotton batting is secured by tufting stitches to prevent the batting from migrating, bunching up, or thinning out. The cover has a zipper and can be removed and washed. 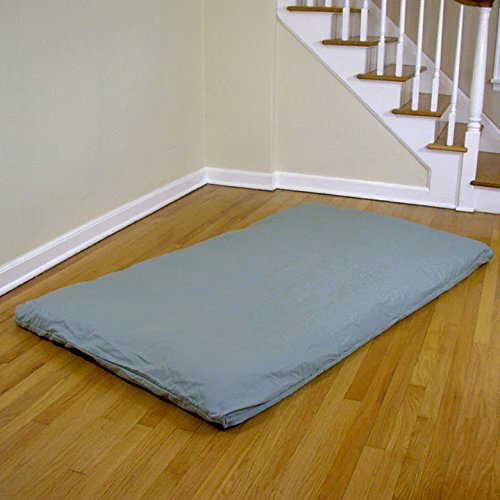 For size comparison, the Shiatsu Massage Mat is equivalent to the length of and and about 4-inches wider than a Single / Twin-Size bed mattress. This mat is very comfortable and designed with both the practitioner and client in mind. You are encouraged to layout the measurements of 78 inches by 42 inches before ordering. NOTE: Packaging is Oversize - Shipping is calculated based on Dimensional Shipping Weight. If you have any questions about this product by Sage Meditation, contact us by completing and submitting the form below. If you are looking for a specif part number, please include it with your message.